Heavy rain struck the Pacific Northwest (Figs. 1, 2) from a series of modest intensity storms, including landfall of embedded atmospheric river conditions (Fig. 3). 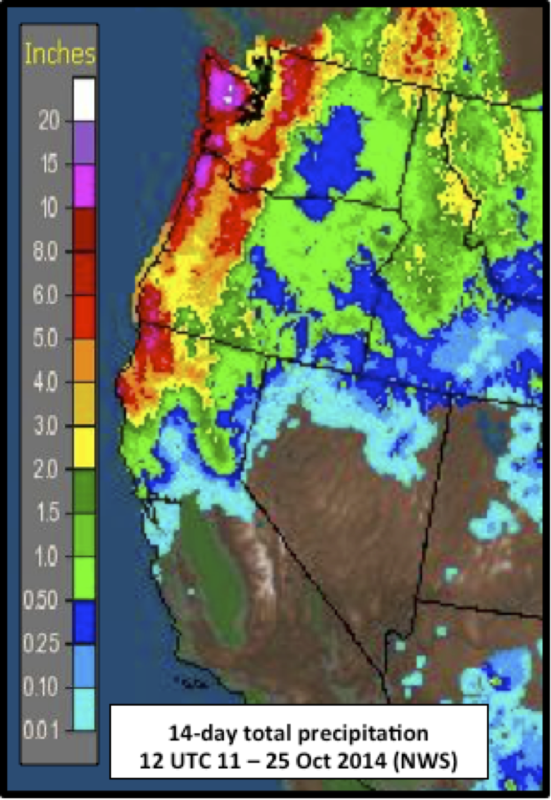 Precipitation totals during the week of 17-24 October approached or exceeded 10 inches in many of the normally wet mountain locations from northwest Washington to northwest California. One of the largest totals, about 15 inches was in the Olympic Mountains. Although some precipitation fell in the headwaters to reservoirs in northern-most California, there was a sharp southern edge to the heavy precipitation that occurred in northern California. Fig. 1. Examples of some of the heaviest precipitation in the region from 17 to 24 October 2014. Fig. 2. 14-day precipitation ending 1200 UTC 25 Oct 2014. Fig. 3. 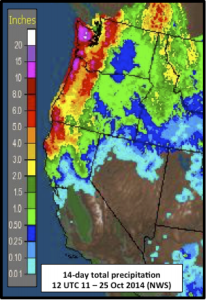 A well-defined atmospheric river on 23 October contributed to some of the heaviest precipitation, including sites that received over 5 inches of rain in 24 hours in southwest Oregon and Northwest California around the time of this SSM/I satellite image (courtesy of CIMSS). The southern end of the AR passed over the Russian River on 25 Oct (Fig. 4) and produced the first rainfall event of the season of over 1 inch accumulation. It lasted about 15 h, roughly half the duration of an average AR in the region. Also, snow was observed on Donner Pass (I-80). Fig. 4. 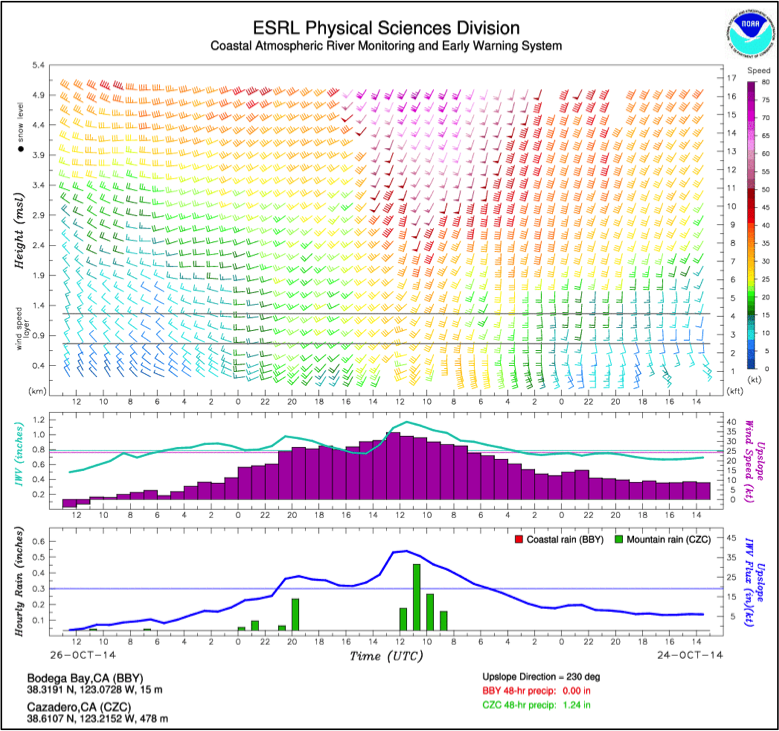 The atmospheric river observatory at Bodega Bay, CA (part of the new state-wide extreme precipitation network sponsored by CA DWR and developed by NOAA and Scripps) documented the passage of the southern end of the first AR of the season in northern California. The “Northern Sierra 8-Station Index” received roughly 1.2 inches, bringing the season total to 2.7 inches, which is about normal to date for the first 4 weeks of the new water year. 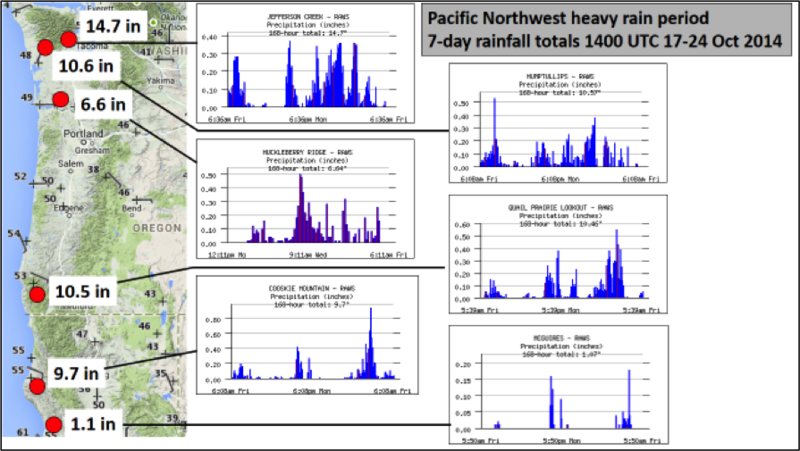 More significant precipitation is predicted for the Pacific Northwest in the next week, from 24-31 October 2014 (Fig. 5). Note once again the sharp southern edge to the heavy precipitation, as occurred in the previous week. Fig. 5. Precipitation forecast for 24-31 October 2014 courtesy of the National Weather Service.